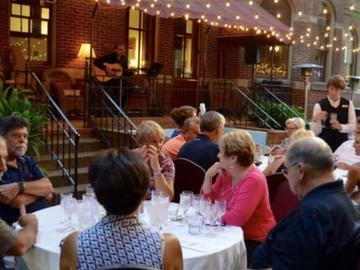 You're invited to join wine host Adam Knoerzer (Certified Sommelier) of Dreadnought Wines & Spirits and us for a night of live entertainment, wine, great food and camaraderie al fresco in our beautiful courtyard (weather permitting) on Thursday, August 16 from 6:30 - 8:30PM or in our spectacular Grand Hall at The Priory. As always, your wines will be paired with innovative and delicious small plates courtesy of our Priory chefs Pete Phillipy and Mike Henney, with dessert by Priory Fine Pastries. Menu and entertainment are TBA. Tickets are $60. For more information, please contact General Manager Rebecca Lazeration at rebecca@thepriory.com, 412.224.6304. Please note: Refunds are not available, however you may be able to use your ticket/s for a future Wine Party within 12 months of purchase.